It took me awhile contemplating if I should put this up, but I decided I should. Maybe an awareness of what I am about to say might help someone some day. After any major marine time accident where lives has been lost, there bound to be some knee jerk solutions. It's usually done with good intentions but sometimes without going deep enough through the thought process. What I want to get at is, after the latest accident in Dec last year at Tg. Leman, and Tioman in 2007, regulator requires that all passenger on ferries are to put on their life vest while on the boat. That is not a "complete" decision as it is one that can get many people kill under the wrong circumstances. It's not to say such device are useless, if you're sitting in an open deck boat or open deck part of the boat your chances of survival will be much better with such a life vest on then without one. It'll keep you afloat (at least for a couple of hours) if you should fall over board or even if the boat capsize, you'll most likely be thrown overboard and you'll be afloat. People inside the cabin should wear those live vest issued on planes instead. Those inflatable type that you can inflate once you get out of the cabin. Have you notice that on the plane when they have the mandatory safety demonstration every time before a flight takes off, they ALWAYS say inflate you jacket AFTER YOU EXIT the plane? Can you guess why? All I want to do here is to highlight to you that there is this risk here when you're ask to put on a life vest even when travelling in a enclosed cabin. 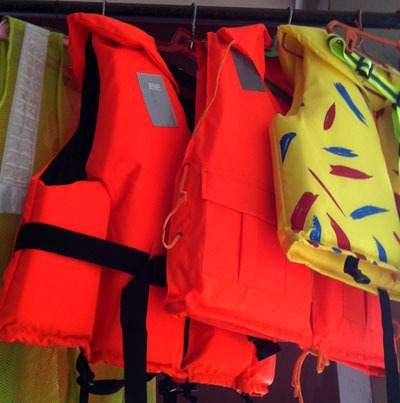 By right they should get the right type of life vest for marine transport within the cabin like those use on the aeroplane or ask people to put on the life vest during emergency evacuation only when they are leaving the boat's cabin. It's okay for those on open deck to put on the life jacket at all time, actually it's a very good idea. I have encounter such ferries service and I have been asked to put on a life vest inside the cabin so there are a few things I can choose do. If possible stay on the open deck, that's what I do when I bring kids. If you have to be in a cabin, stay near an exit a big one if possible (remember the life vest is bulky will get tangle in small opening easily). Or just don't secure it, so that it's easy to toss when you need to. For a boat to capsize without any prior warning is an unlikely scenario but it has happened, would more people inside the cabin have been saved if they had a life vest on? I leave you to think about that.